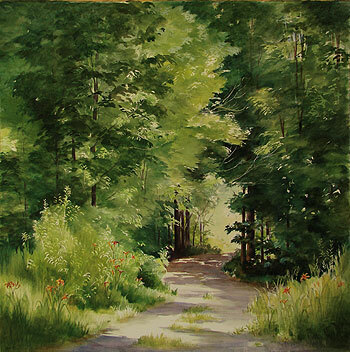 "Owl Bark and Birch Feathers"
It's always an invitation.... Susan Bull Riley's paintings tempt you to enter the scene and follow the wooded path or sun-dappled roadway, to explore the emerald cathedral of forest and examine the rich detail of its undergrowth. Her botanical masterpieces pull you in as well, so perfectly rendered you might expect they are living specimens you could touch and smell but for the glass. 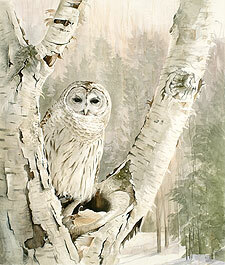 Birds, too, are a favorite element brought to life in many of Susan's works. In August and September you are invited to see some of Susan Bull Riley's oils, watercolors, and giclée prints at Adagio Trattoria, located at 136 Main Street in downtown Brattleboro. The restaurant is open for dinner seven days a week, lunch from Thursday through the weekend. The bar opens at 3:00 on Monday, Tuesday, and Wednesday, so any late afternoon might be a good time to stop in for a leisurely view of this exhibit. "I grew up singing lots of songs that had to do with the beauty of the earth, and those early words no doubt contributed to the way I feel about the natural world. A broad love of song and melody led to ten years working as a concert flutist and flute teacher. A similar impulse to paint, however, also generated by strong feelings for the outdoors, grew up alongside music-making and now dominates my life." 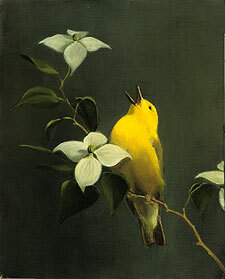 "Singing Warbler Greets the Dawn"
Susan was finally able to return to her home state when she and her family moved to Marlboro, Vermont, in 2006. 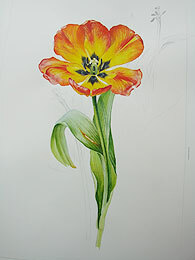 She paints full-time except for when she is teaching a class in botanical watercolors at the River Gallery School. Her ties to music are maintained in part through participation with the Hallowell hospice chorus; in part through the Brattleboro Music Center, where her husband Richard is the managing director; and also through the occasional opportunity to play flute with friends. She has won many awards for her art, which is disseminated around the country and beyond in private collections as well as in the permanent collections of the New York State Museum and the Cornell Laboratory of Ornithology. Come away with Susan Bull Riley to her garden, across the nearby meadow, down the roads of summer, and into the woods -- the journey is your rich reward. 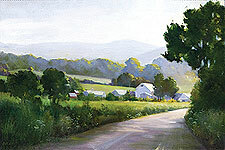 NOTE: Additional information and images of Susan's work can be found at her website: www.susanbullriley.com.